Pound pork chops with a meat pounder to make it tender. Marinate with coarsely ground black pepper and salt. Set aside. Heat up a sauce pan on low heat, add in bacon pieces and constantly stirring until the bacon become crispy and fat has rendered. Remove and drained on paper towel to absorb excessive oil. Stir in the all-purpose flour until lightly brown. Add in water and concentrated chicken stock. Bring to a boil. Remove and set aside for later use. Heat up a pan with 2 tbsp of olive oil, pan-fry the marinated pork chops until brown on both sides. Remove and set aside. Use the remaining oil to saute the sliced onion, chopped garlic and fresh thyme leaves until the onion turn soft. Add in the reserved chicken stock, bay leaves and bring to a boil. Add in the pork chops and bring to a boil again. Covered, turn heat to low and continue to simmer until the pork chops turn soft and sauce become thickens. Meanwhile, bring some water to a boil. Add in salt and fettuccine and continue to cook until al-dente. Remove, drained and toss well with 1 tbsp of olive oil. Once the pork chops are fork tender. Add in chopped parsley into the sauce and season with coarsely ground black pepper and salt. To serve: Place a bed of fettuccine on a serving platter. 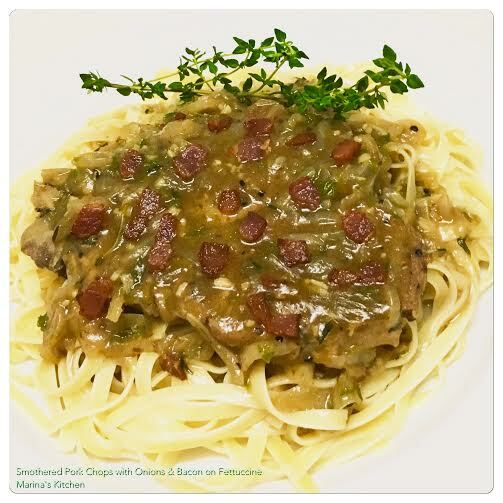 Top with smothered pork chops and gravy. Garnish with bacon bits and thyme sprigs. Serve.